When the Canadian Museum of History began planning a new exhibition on the Franklin expedition, neither of the voyage's two doomed ships had been found. 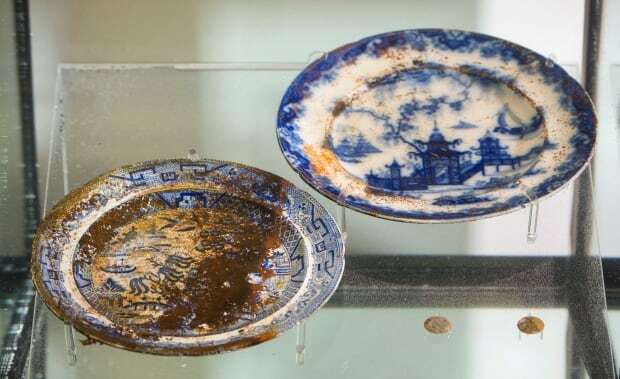 But after HMS Erebus was located in 2014 and HMS Terror was found in 2016, curators for the exhibit were given the opportunity to include some of the newly recovered artifacts. The exhibition, now on in the United Kingdom, also highlights the role that Inuit oral history played in finding the shipwrecks. "We really wanted to give credit where credit was due in the exhibition," said curator Karen Ryan. "The Inuit were in the Arctic long before Europeans went looking for the Northwest Passage. "What we know up until now about what happened to the Franklin expedition comes largely from Inuit oral history that has been passed down for 170 years." Ryan noted that Parks Canada and researchers started looking in areas where the Inuit had indicated they had seen ships still inhabited and then later deserted. The expedition led by Sir John Franklin left England in 1845 with 129 men to search for a northern sea route between the Atlantic and Pacific oceans. No one ever returned, and search missions determined that both ships became icebound and were abandoned. Remains of some of the sailors have been found. Some theories about the ill-fated voyage include lead poisoning and spoiled tinned preserves. Interest in the mystery has remained strong in the U.K., where some people trace family trees back to Franklin's men.